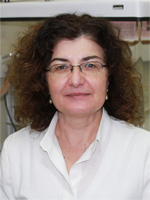 M. LOURDES CALZADA obtained her PhD degree in Chemistry at the University of Alcalá de Henares (Madrid) in 1990 in the field of piezoelectric ceramics of high anisotropy obtained by sol-gel methods. Next year, she moved to the School of Materials of the University of Leeds (United Kingdom) where she enjoyed a two-year postdoctoral fellowship working in solution deposition of ferroelectric thin films. In 1998 she obtained a permanent position as Tenured Scientist of the Spanish National Research Council (CSIC, Spain) at the Materials Science Institute of Madrid (ICMM), where she started a research line on functional metal oxide thin films. In 2010 she was appointed to Research Professor at ICMM-CSIC, where she is the head of the Electroactive Oxides for Smart Devices (EOSMAD) research group. Her present R&D interests include synthesis by soft-chemistry routes and characterization of nanostructures, thin films and bulk materials of functional (dielectric, piezoelectric, ferroelectric and multiferroic) metal oxides for microelectronics and flexible electronics; design of homo- and hetero-metallic molecular precursors of high-tech oxides; engineering of high-performance oxide compositions; and sustainable processing methods for advanced materials and emerging technologies. Her current research projects are highly interdisciplinary and mostly focused on the development of low-temperature sol-gel synthesis strategies to attain metal oxide materials and the integration of functional thin films and self-assembled systems with semiconductor and flexible substrates (Si-technology and Flexible Electronics – Electronic Skin, Wearable electronics). She has pushed her group to a world-leadership position on this topic, being pioneer in the low-temperature solution processing of ferroelectric and multiferroic complex oxides for flexible electronic devices. PROF. CALZADA has been involved in more than 30 R&D projects (European/National R&D projects, European R&D Excellence Networks and European Science Foundation COST Actions), coordinating 8 National projects and 2 European projects, and being the Spanish Representative of the COST514 Action on Chemical Solution Deposition of Thin Films. She has published over 175 papers with more than 2000 citations and a h-index of 25 (ResearcherID, ORCID, Research Gate, Google Scholar Profile). She has given over 50 scientific and technical talks at international conferences, 15 of them Invited Talks and 10 of the latter in the field of the low-temperature processing of films. These were presented in recognized international conferences, such as those of the Materials Research Society – MRS; Materials Science & Technology – MS&T; European Materials Research Society – EMRS; or Electroceramics. She has published 9 book chapters and is co-inventor in 3 patents of application. She has(is) supervised(ing) several post-docs, 6 PhD Thesis (two of them obtained the extraordinary award in PhD chemistry in their corresponding universities) and several MSc Thesis, contributing to the formation of professionals who are now incorporated to the academic, research or industrial sectors. She regularly acts as evaluator for several national and international funding agencies, belongs to the steering committees of several national and international conferences and participates in university under- and post-graduate programmes.